As of 2015, over 40% of textile exports still come from high income countries. Meanwhile, upper middle income countries are quickly expanding exports and gaining more market shares from 2000 to 2015. 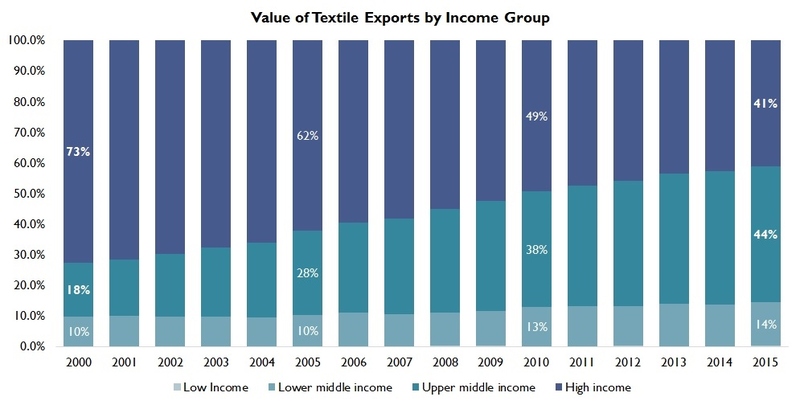 However, textile exports from low income countries remain minimal. 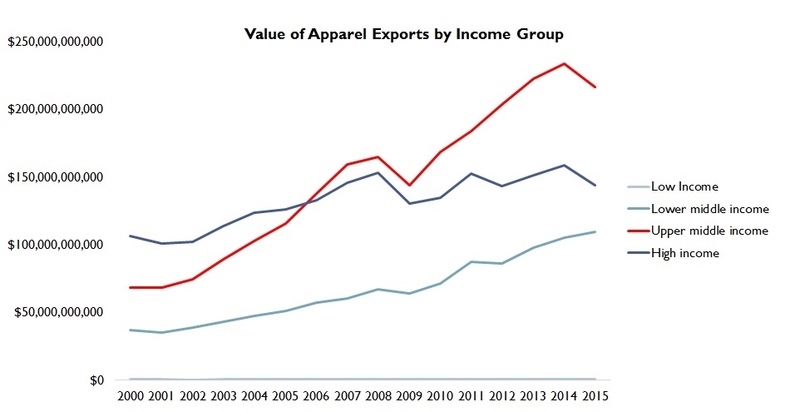 From 2000 to 2015, shares of apparel exports from high income countries dropped from 50% to 31%. Meanwhile, market shares of upper middle income countries increased from 32% to 46%. However, low income countries are becoming even more marginalized in apparel exports: their market shares slipped from 0.3% in 2000 to only 0.1% in 2015. 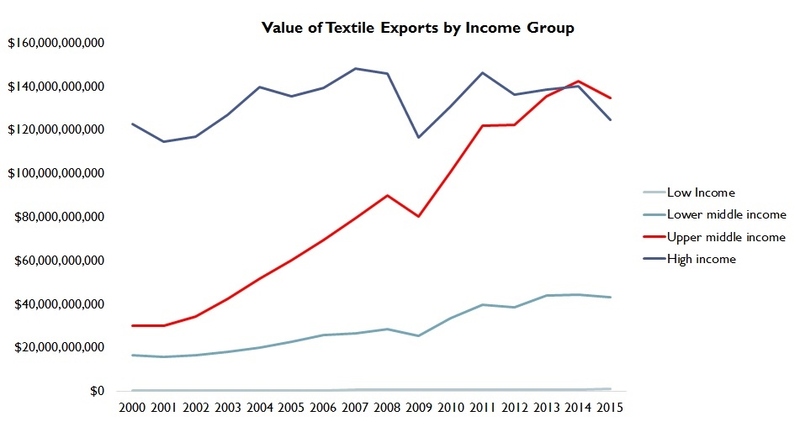 Additionally, textile and apparel exports in general are economically more important for lower income countries than higher income countries. However, the percentage of textile and apparel in a country’s total merchandise exports seem to be declining across all income groups except for low-income countries. Meanwhile, for a good number of low-income and lower-middle income countries such as Bangladesh, Gambia, Pakistan and Cambodia, textile and apparel remain one of their very few exporting opportunities. Acknowledgement: Thanks to Sheiron Crawford for assisting the data collection. Professor, this is very interesting data. I am curious about how countries were classified by “income group.” Was it GDP per capita? Some of the designations as “low income,” “lower middle income,” and “upper middle income” surprise me. It also is surprising that the high income countries have, although declining, such a significant percentage of market share. It seems to suggest that there can be an alternative narrative to the “race to the bottom” in wages for garment workers. I see, following the data to the World Bank link, that the data is GNI per capita. Hi Chris, it was nice to hear from you and thank you for your great questions. First, income group is defined based on a country’s gross national income per capita. Low-income economies are defined as those with a GNI per capita, calculated using the World Bank Atlas method, of $1,025 or less in 2015; lower middle-income economies are those with a GNI per capita between $1,026 and $4,035; upper middle-income economies are those with a GNI per capita between $4,036 and $12,475; high-income economies are those with a GNI per capita of $12,476 or more. Regarding your second point, I think it is a misunderstanding that nature of the game in the apparel industry is always “race to the bottom”. Yes, production and sourcing cost remains one of the top challenges for US apparel companies. But wage level is one of many factors that affect companies’ total landed cost. Despite the low wages, many least developed countries are still lack of competitiveness in apparel exports because of their poor infrastructure, high cost of transportation and workers’ low productivity. On the other hand, high-income countries like Germany, Italy, France and UK remain leading apparel manufacturers in the world. Many of their products are luxury goods and technology-driven. Thanks, professor, for replying to my remarks. I appreciate you taking the time. About the “race to the bottom,” my position is that being stuck in it, driven to sell “cheap” goods, is what ails many retail institutions. Their sales need a deeper, richer narrative. The data you shared suggests that some in the fashion industry have been successful in telling a different story about the goods that they produce. For my part, I seek a living wage for garment workers, and I believe that supply chains in the garment industry that place a higher regard for human rights and the well-being of their labor force will reap marketplace benefits. It’s not enough to avoid “risk exposure” in unsafe factories, human trafficking in the supply chain, and environmental degradation as outputs of factories; a stronger narrative for the garment industry responds to an evolving social contract that includes greater expectations that multinational corporations bear some responsibility for poverty and care of the global community. The data and graphs reflect an interesting phenomenon that although the total value of Apparel and Textile exports has a rising trend over the past 15 years, the share of Textile and Apparel trade in a country’s total merchandise exports continued to decline. This implies that the growth rate of apparel and textile industry has lagged behind the pace of development of other manufacturing industries. Take China for instance, the Textile, Apparel and Footwear manufacturing exports used to be a major part of Chinese manufacturing exports before 21st century. After 2005, the makeup of Chinese manufacturing exports moved toward high technology such as telecommunications and electronic machinery. The dramatic transformation of China’s export structure over the past 15 years implies that its business environment is relatively more flexible than before, enabling it to move in and out of different sectors. Meanwhile, the increasing fragmentation of production is underway, among high-income countries and two sectors of middle income countries. 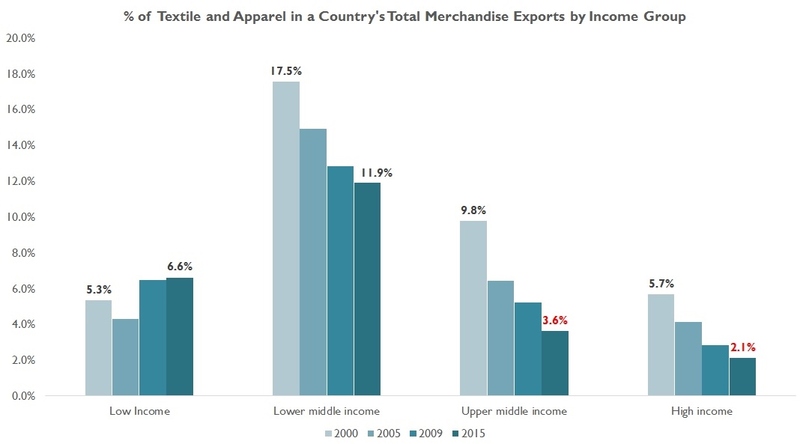 Lower-middle income countries have become more dependent on apparel and textile exports than its counterparts. It is possible that the ratio of textile and apparel in upper-middle income countries’ exports will become even lower in the future. Great interpretation of the data! As you may remember, in the class I mentioned that T&A could account for over 2/3 of jobs and 60-90% of total merchandise exports for many poorest countries in the world. This pattern, on the one hand, illustrates the importance of the T&A sector, but on the other hand, suggests that these developing countries are still at the early stage of industrialization. It is hopeful that these developing countries can gradually diversify their exports and reach a more advanced stage of economic development (i.e. they not only can make apparel, but also other more profitable and complicated products). So it is not always a bad thing to see a declining share of T&A in a country’s total industry output. I think it’s very interesting to see that exports are rising in the middle-income countries but still continuing to decline in low-income countries. I think one major company needs to pave the way and start a factory in a lower income country in order to get the people of these countries back on their feet, at least a little. I think there is great opportunity for lower income countries to increase their exports. There are great advantages and may significantly help the country as a whole. Many countries of this status rely on the textile industry in order to keep their economy growing. Many countries have seen economic growth because of textile manufacturing and this success needs to be spread to other countries that may not be doing as well. After overlooking the data of textile and apparel exports for certain income groups, it really justifies what I have learned within FASH455 and how more developed countries focus on the apparel aspects and developing countries focus on the apparel aspect. These under developed countries like Bangladesh rely on countries like the U.S. for textiles to manufacture apparel in order to improve their economy. Middle-income countries are indeed seeing in increase in their quality of living, due to a increasing economy and workers are able to earn more money, so they do want to import more goods, instead of producing everything themselves. Countries that have a poorer economy are maybe stuck in one place because their industries do not require much skill, so therefore they pay a lot less. They may need help from more developed countries to advance their industries a little, and improve their economies. This could be introducing more technology or even assisting with import costs with some kind of trade agreement that will really benefit them. 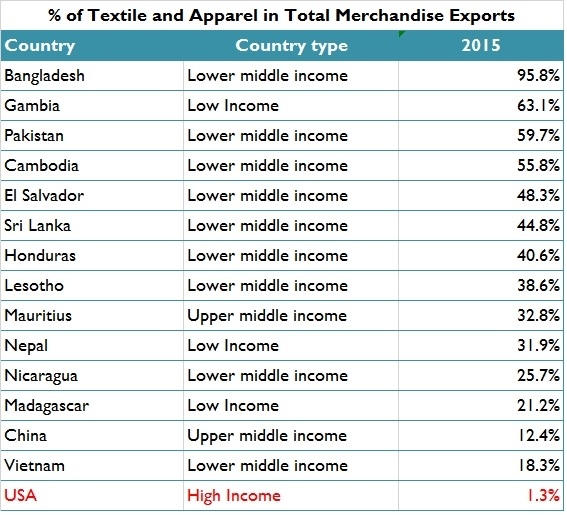 From these data, I found the lower middle income countries account for the biggest part of textile and apparel in total merchandising exports, but the value of apparel textiles is not very high compared to the upper middle income countries. It concludes that upper middle-income countries have better capability to exports textile and apparel because they have better resources, better machinery and other related technique skills. The other important reason is upper middle income countries try to focus more on textiles because they have better skills. 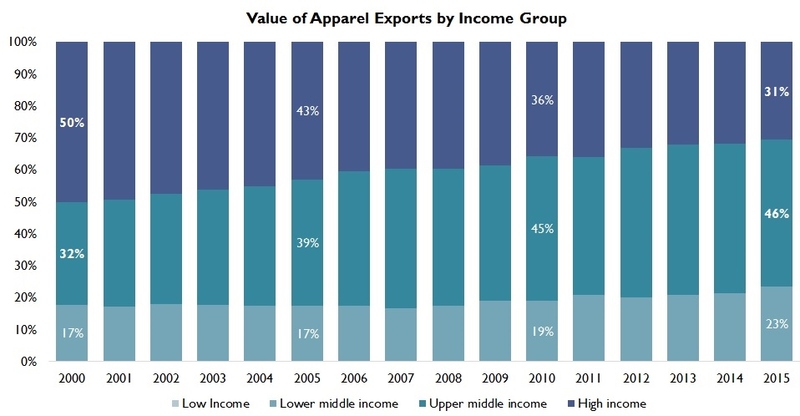 As for lower middle income countries still focus on manufacture apparel exports. T&A industry is one of the important ways to enhance one’s country economy. I think it is clear that less developed countries are stuck because they have not had the chance to transform. They can be helped by becoming more globalized and included with the more developed countries. Their economies need to be stimulated in order to make it to where a middle class enjoys a daily life and spendings. Lower-middle income countries make up most of the exports in the apparel and textile industry, but they seem to be stuck. Upper-middle income countries are seeing a slight increase in their quality of life due to their ability to grow. Lower-middle income countries are kind of stuck, looking for stimulation and growth wherever they can get it. The success of the textile manufacturing directly affects the status and growth of the country. There definitely seems to be a trend for less developed countries to be passed over for opportunities to grow in favor of middle-income countries. The T&A industry has the opportunity to help develop these countries by creating infrastructure there, but it may be necessary to find greater incentives for these firms to take the risk for these countries.